While players in Europe and Japan are enjoying their December Splatoon 2 multiplayer event this weekend, North America just received its Splatfest team names and date reveal. The festively themed North American Splatfest will kick of next Friday, December 15th, at 9:00 p.m. PT / midnight E.T. The Splatfest announcement came from Nintendo Versus, Nintendo of America’s official competitive gaming Twitter account. 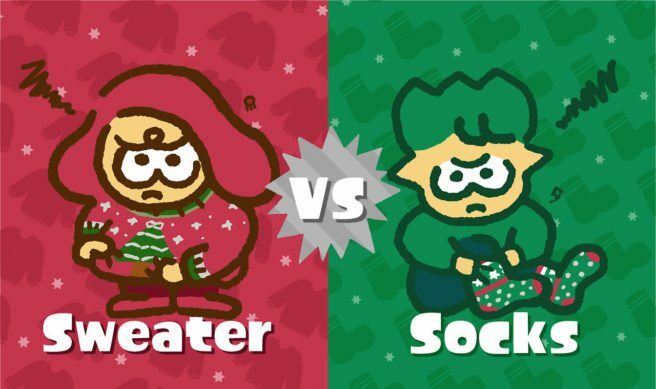 If you want to take part in December’s Splatoon 2 event, you will have to decide which cozy clothing item you would rather receive as a present — a sweater or socks. I am aggressively Team Sweater and think anyone who votes Team Socks should be splatted like the fools they are… but, ya know, you can make your own decision. Be sure to pick your team before Pearl and Marina take the stage and the Splatfest starts up. To do so, head to the video screen in Inkopolis Square and select either Team Sweater or Team Socks. You will then receive your Splatfest tee, which you should pop on your Inkling for several matches before the event to unlock an ability or two. Splatfests are scored with three numbers: popular vote, solo wins, and team wins. The event will run for a full 24 hours before the results are tallied. While North American Splatoon 2 players are seeing a holiday-themed Splatfest this month, European Inklings are fighting over books and films this weekend. Additionally, Japan’s event is tasking players with choosing between warm inner wear and warm outerwear. It’s basically Heattech vs. Ultra Light Down in collaboration with UNIQLO. The next North American Splatfest begins December 15th at 9:00 p.m. PT. Are you Team Sweater or Team Socks? Let us know in the comments below.